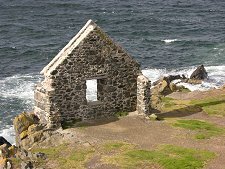 Portsoy lies on the north facing coast of Aberdeenshire, approximately midway between Cullen and Banff. Of all the many ports along the Aberdeenshire and Moray coasts, Portsoy was one of the earliest to be established, and as a result is one of the most fascinating. 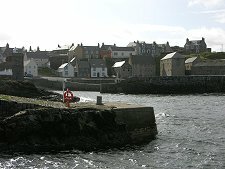 Portsoy was established as a burgh in a charter signed by Mary, Queen of Scots in 1550, and the first harbour was built at around the same time. In 1692, Sir Patrick Ogilvie, the 8th Laird of Boyne replaced the existing harbour with another built entirely of stone. The Lairds of Boyne had long been influential in the area, having built the clifftop Boyne Castle nearby in the late 1300s. 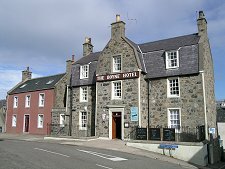 Its replacement, the Palace of Boyne built in the 1570s - probably with profits being generated from Portsoy's trade - was still being used as a grand house in the mid 1700s when the Ogilvies' support for the Jacobite cause led to their being stripped of their lands. Its ruins now stand a couple of miles to the east of Portsoy. The harbour they built at Portsoy comprised a massive breakwater on the seaward side and a number of quays. The construction uses large stones set vertically, apparently because it was believed that this made them less likely to be washed away by the sea. The theory seem to have worked, because the Old Harbour you see today is largely the harbour that was built in 1692. 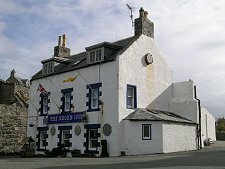 Around the Old Harbour are a number of impressive buildings that date back to the end of the 1600s or early 1700s, with buildings getting progressively younger as you climb the hill away from the harbour towards the very attractive Square in the heart of the uphill parts of Portsoy. 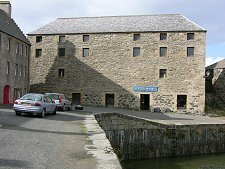 The trade in Portsoy's early days was very varied, and included the import of coal for domestic fires and the export of locally produced thread and linen to England. 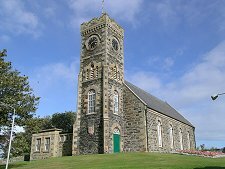 A particular speciality was locally quarried green Portsoy marble or serpentine. This was extracted from a quarry to the west of the town, and some of it found its way into the fixtures and fittings of Louis XIV's Palace of Versailles. Portsoy marble is still worked locally and a range of products are on view in one of the warehouses overlooking the harbour. Further around the bay, in the upper left of the header image, is the New Harbour, built in 1825 to meet the demands of the herring boom and the volume of trade going through Portsoy. This had to be rebuilt following storm damage in 1839. Fishing and trade declined at Portsoy through much of the 1900s, but thankfully the charm and character of the town survived long enough to be appreciated by tourists visiting the area. 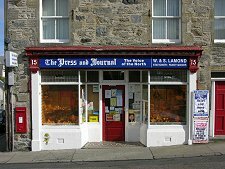 A number of regeneration projects from the 1970s onwards succeeded in giving Portsoy its heart back, and what you find today is an attractive uphill town centre with fascinating streets winding down to the harbour.